Bean and Lentil Hacks Mix, Coat, Swap and Top | JPMA, Inc. Fiber, which helps keep you regular and helps you feel full after a meal. Certain fibers can also help control blood cholesterol levels and prevent heart disease. 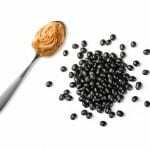 Bean and Lentil Hacks for Better Health. While they take more time to cook than canned, dried beans have a rich flavor that is worth the wait. Soak beans according to package instructions and then cook over night on low in a slow cooker. Cook a big pot of dried beans on the weekend and freeze them in 1 quart freezer bags for weeks of easy use. Top salads with lentils, black beans, or garbanzo beans for extra protein, flavor, and texture. Mix mashed beans into meatballs, meatloaf, or burgers to get more servings out of the recipes and improve the texture of the food.